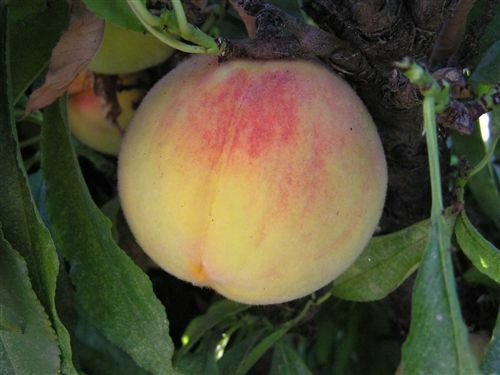 This season's featured fruit is the venerable peach, along with its close relative, the nectarine. While we have never heard anyone say that something is nectarine-y, saying that something is peachy means that it is cool, groovy and ever so desirable! And really, what could be more desirable than the utter lusciousness of a juicy ripe peach or nectarine just picked off your own tree? One of the finest aspects of both of these fruits is that there are varieties suitable for both mild and cold winter areas as well as everything in between, so virtually everyone can grow them. 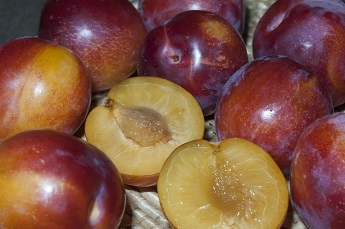 In addition, it is possible to extend the picking season for months when varieties are chosen for successive ripening. 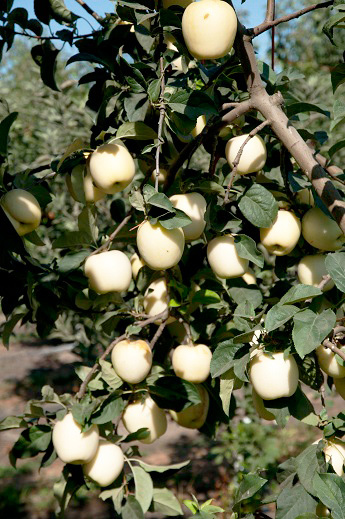 Both fruit types are easy to grow with both yellow and white varieties available. Some have spectacular spring bloom, such as Double Delight and Atomic Red Nectarines (left) and Saturn, Double Jewel, Fantastic Elberta, Garden Gold Miniature, Rio Oso Gem, Tropic Snow, May Pride and Red Baron peaches. Even varieties with regular flowers are lovely in bloom and very attractive to bees. If you are not particularly interested in the fruit but would love the beautiful floral display, there are flowering varieties such as Double White, Early Red, Late Red, Peppermint and White Icicle peaches. New in the fruiting category this year are Peachy Keen peach, a very low chill variety that hails from Shell Beach just down the highway from our nursery (supplies are limited), and Golden Glory (right), a cold hardy miniature peach with gorgeous blooms. If you have not already made your orchard as peachy as it can be, this is the time to do so! The fine folks at Zaiger Genetics have come up with three more winners for this season. The Ghost apple (left) is unique with completely white skin and flesh. One might think that it would burn easily, but this apple loves the heat! Sugar Twist Pluerry is the newest addition to the Pluerry clan, exhibiting yet another flavor variation of the cherry/plum cross. This one has the sweet taste of a ripe cherry with a twist of plum. And, at last, they have come up with a self-fruitful low chill cherry! 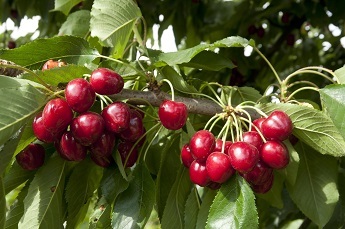 Currently known as 6GM25 (but to be more imaginatively named for next season), this cherry ripens in early May and has bright crimson fruit with superb flavor. 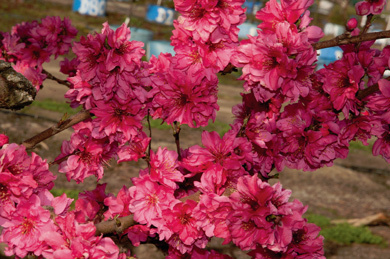 It comes from the same lineage as Minnie Royal and Royal Lee and is interfruitful with both of those varieties. Please note that supplies were very limited - in fact, we are already sold out for this season. Many apologies! 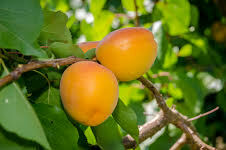 We have a new apricot this time around called Helena (left). 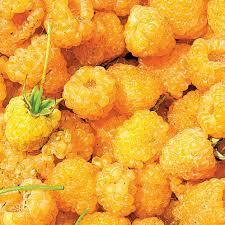 It is big and juicy with deeper orange skin and firm, sweet flesh. We have also added Hana Fuyu Persimmon(left) to our selection of this very popular fruit. 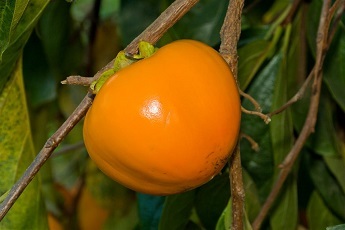 Hana Fuyu is non-astringent and is a reliable producer of large dark orange fruit. In the smaller fruit category, we are happy to introduce Ken's Red Kiwi (left) with red skin and flesh - very unique! It is pollinized by Hardy Male Kiwi, also new this season. 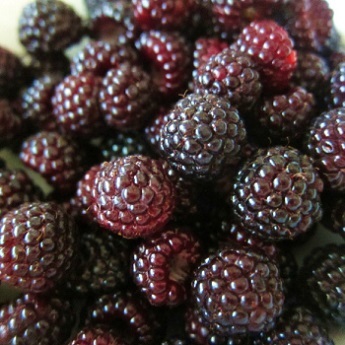 We have added two new potted raspberries - Anne (left), an everbearing variety with large, sweet yellow berries, and Jewel (below) with large, glossy black berries of rich flavor. 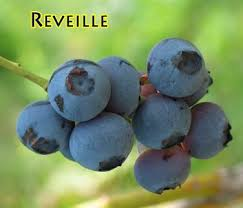 ...and Reveille Blueberry with outstanding flavor and hot pink blooms.